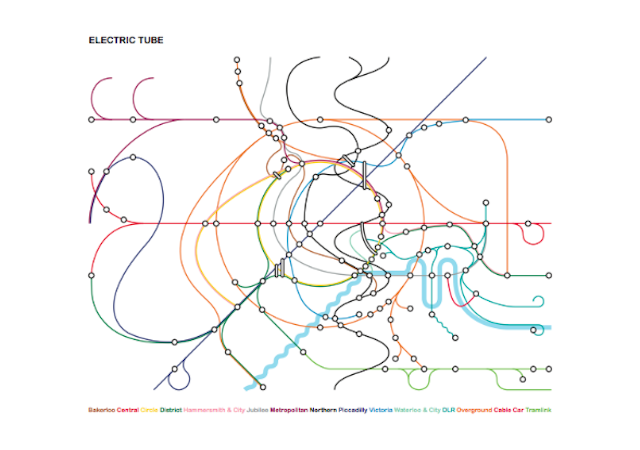 Electric Tube Map by Ollie O'Brien. If there's one thing we love, it's a London map — the quirkier the better. And we've long loved the work of Ollie O'Brien, one half of the team at cartographer's heaven, Mapping London. Ollie has now produced two new maps for purchase. The Electric Tube started from the premise of drawing circular Underground routes (Circle Line and London Overground) as actual circles, with the Piccadilly and Central Lines represented as straight lines. The Northern Line looks like it's had one too many pints, but the map has a strong degree of topographical accuracy. We particularly enjoyed the scenic route that the cable cars seem to be taking. The map reminds us of the work of Max Roberts, whose similarly curvy charts are also for sale. The North/South map is simpler, but equally fascinating to look at. The only features marked are buildings, meaning that open spaces such as parks and rivers are conspicuous by their absence, and large buildings such as the O2 are easy to spot. Can you see your house/workplace/pub you ended up at last night? Prints of either map can be bought from Ollie for a very reasonable £15.